Although the BSR attachment is deserving of the attention it has received, the 440 QE offers sewers, quilters, fiber artists, and other artisans a host of other features worth noting. I can’t promise that this post will cover every single bell and whistle, but I will give you a list of my favorite things about this wonderful sewing and embroidery machine. 1. The Manual – Bernina writes a great manual that is detailed and easy to understand. 2. Reinforced Soft Cover – Bernina includes a carrying case with compartments for accessories. 3. Accessory Box – I love this thing. It attaches to the back of the machine for easy transport. It detaches for desk top use. There are compartments for bobbins, presser feet, sewing machine needles, and two drawers for other small parts. 4. Walking Foot – A two sole walking foot with seam guide comes standard with the machine. 6. 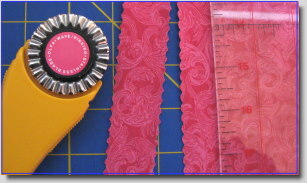 Clear Slide On Table – There are seam allowance markings on the table as well as a ruler in inches and centimeters. Although listed as optional, my machine came with a slide on seam guide that is fully adjustable the entire length of the table. 7. Bobbin Winder – Bernina makes a great bobbin winder with a separate motor. This one even has a little thread cutter on the on/off switch. A collapsible vertical spool pin on the right side of the machine makes winding bobbins while sewing or embroidering quite easy. 8. Cool Fluorescent Light – What a difference this makes. I’ve actually burned my hand from the heat buildup on other machines. 9. Manual Presser Foot Pressure Dial – This dial is on the head frame, making it easily accessible. 10. 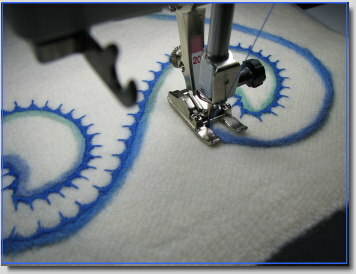 Free Hand System – My Bernina 1230 has this feature as well. 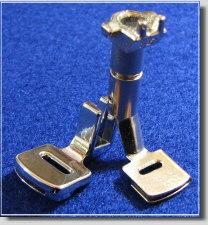 With a little push from your right knee, the presser foot raises and lowers. 11. Horizontal and Vertical Spool Pins – Sewers need both and Bernina provides them. 12. Thread Tension Adjustment Wheel – I like having the ability to adjust the upper thread tension manually. I use many different threads and make adjustments frequently. I also like having the dial in constant visual range rather than having to open a menu to see what my tension is set at. 13. Push Button Feed Dog – The feed dog button is easily accessible from the lower right hand side of the machine. 14. Slide Speed Control – I use this feature constantly. 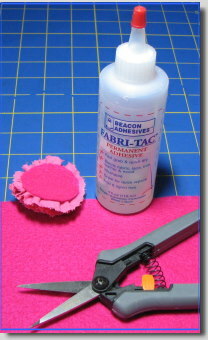 It also works when winding bobbins and with the BSR attachment. 15. LCD Screen – The LCD screen displays a lot of important information while you’re sewing, such as needle position (there are eleven to choose from), stitch width and length, needle up/down position, recommended presser foot, presser foot pressure, stitch selection (there are 379), mirror image, pattern begin/end, BSR, memory display, service notifications, and more. It’s a lot to take in at first, but after a little use your eyes become trained and it all becomes second nature. 16. Memory – Up to 90 stitches, letters, or numbers can be saved in memory along with stitch length, stitch width, and needle position alterations. 17. Multiple Brand Sewing Machine Needles – You can use various brands of sewing machine needles. I mention this because it’s not true of all machines. I have a top-of-the-line machine manufactured by another company that can only use Schmetz needles. 18. Quick Reverse Button – Bernina has conveniently located this button in the lowest position on the front of the machine (above the needle), making a few quick reverse stitches super easy. A continuous reverse function is also available. 19. Stitch Selection Card with Holder – Sometimes the stitches displayed on the LCD screen don’t match up well with the actual stitch, so Bernina has included a double sided stitch card with a picture of each stitch and its corresponding number. The machine handle has a clamp that holds the card. 20. Versatility – This is the thing that I find most endearing about the 440 QE. For general sewing, the machine has all the features you need, along with a powerful motor. For quilting, the machine has 32 built in quilting stitches and comes with a walking foot, a real bonus. Of course, the star of the show is the BSR attachment. Additionally, the 440 QE is an embroidery machine when purchased with the optional embroidery unit. 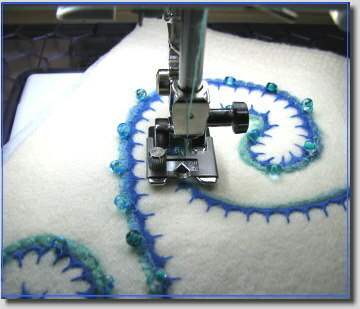 You will often find that midrange sewing/embroidery machines come with smaller embroidery fields. Not this machine. The large (145 x 255 mm) oval embroidery hoop is standard. One more optional feature is the Bernina Needle Punch Accessory Set. I just purchased this attachment a few days ago as a backup to my Babylock Embellisher and will do a review once I’ve had time to work with it. There you have my twenty favorite things about this sewing machine. I believe it only fair to mention a few things that I wish were different. The extent of the stitch width is 5.5 mm. It would have been nice to have at least 6 mm if not 7 mm. Also, since this machine is named “Quilter’s Edition,” patchwork foot #57 with the side guide should be standard. Instead, Bernina packs it with the patchwork foot #37. And now a little about the BSR. Whenever you try something new, it’s going to be a little awkward at first. 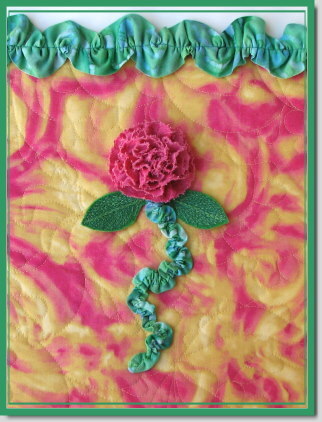 If you’ve done any amount of free motion quilting, you know that a certain feel and rhythm develops over time. The BSR has its own feel and rhythm. The more you use it, the more accustom you become to it. At first, I considered it akin to training wheels on a bike. However, I now find myself using it more and more. If you’ve been given the impression that it always makes perfectly even stitches, let me disabuse you of that idea. The human factor remains. If you jerk your hands you will have jerky looking stitches. However, if you keep a nice even flow to your movements, you will be rewarded with some of the nicest looking quilting stitches around. The BSR does have a few quirks. It hates basting sprays, some more than others. I can get away with a light touch of 505, but anything else and I’ll have skipped stitches. Some have found that the BSR works best with top stitching needles. Others think it works best with silk thread. I have used Organ sharps with cotton quilting threads of different weights quite successfully, making tension adjustments along the way (it helps to make a chart of needles, threads, and tension adjustments). The BSR that comes with the Aurora 440 QE only does straight stitches. The BSR included with the 730 also does free motion zig zag stitches. Personally, I don’t think I would use it for zig zag stitches even if had that capability, but it’s something to consider. There are two modes of operation to choose from and three free motion feet included with the attachment. I hope you find this information helpful. If you’re interested in this machine, please visit your local Bernina dealership and give this fine machine a trial run. The temperature is supposed to reach 60 degrees here today and I’m thinking flowers! For this project I chose a commercial pink print that kept most of its color on the back side. 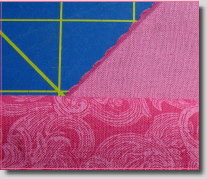 Using a rotary cutter with a pinking blade, I cut a bias strip of fabric 1 1/2 inches wide. Next, I set up my sewing machine with a straight stitch at 3 mm and attached a gathering foot. Generally, the longer the stitch length, the greater the gathers. A little trick I use is to put my finger behind the foot as I’m sewing and gently give the fabric feed a little resistance. This foot is easy to use and always does what it was designed to do. 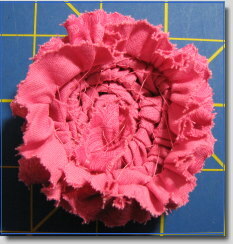 To form the flower, I folded right sides together at the stitch line and finger pressed the fabric. I then held one end with my fingers and began wrapping the folded, gathered fabric around the center. 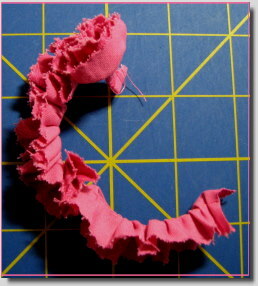 When the flower reached the size I desired, I clipped off the remaining fabric strip. To keep the flower together, I threaded a needle and hand sewed the back, using large stitches. 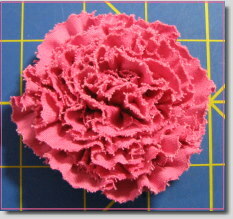 I then cut a round piece of craft felt a little smaller than the circumference of my flower and glued it to the back with fabric glue. That completed the flower. I then cut my main fabric the size I needed for my project. I backed it with Decor Bond and a thin quilt batting. After threading my sewing machine with a matching thread, I lowered the feed dogs and free motion quilted the top, using a floral design that I thought up as I stitched. In part two, I’ll share with you how I made the ruched stem and trim, and the thread painted leaves. Note: Some of you have asked about the Bernina Aurora 440 QE. I hope to write a little review of this wonderful machine in the next few days . Hang in there! I found these skeins of spun wool roving at the store last week. 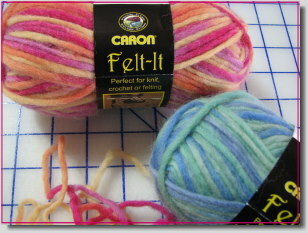 With a name like “Felt It,” I knew I had to take them home with me. I immediately saw their potential as detail yarns in needle felting projects, but I knew they would surprise me with many other talents as well. Recently, I had been looking at all those old quilt stencils hanging on the back of the studio door. If you’ve been quilting for any amount of time, you probably have a collection of them yourself. So I took a few off the rack and decided to put them to work. First, I cut two pieces of 100% wool fabric that had already been through the fulling process in my washing machine. 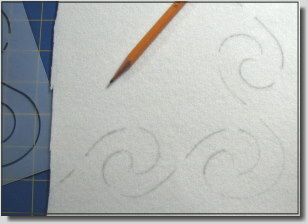 Taking the first stencil and a #2 pencil, I lightly outlined the design onto the wool. Next, I took the “Wildflowers” yarn and needle felted it along the outline with the Babylock Embellisher. The felted design looked rather nice just as it was, but I wanted to play with it a little more. I chose a decorative stitch (#113 on the Bernina Aurora 440 QE) and stitched around the felted outline, using a royal blue 40 wt. matte embroidery thread. What a dramatic difference that made! Not quite ready to call it a day, I then took some Czech glass beads and attach them to the outline by machine. Attaching beads by machine can be a little tricky at first. 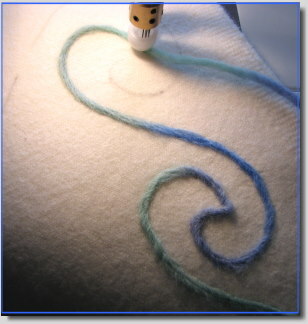 For this project, I set my machine on a blanket stitch (the stitch often used around appliques) and counted four left swings of the needle, setting my bead inside the presser foot (a Babylock braiding foot) at the beginning of the fifth swing. Using my right hand to turn the wheel, I carefully guided the needle into the hole of the bead and back to the right again and continued this way until I had completed the full design. I could have chosen to attach the beads by hand, but I thought the blanket stitch might work well with this particular design. I was pleased that I had found a secondary use for the quilting stencils. Although I worked on wool yardage, the process would be the same on the surface of a quilt. Such wonderful textures can be created playing around with this technique. With quite a bit of the skein left, this yarn still had work to do. 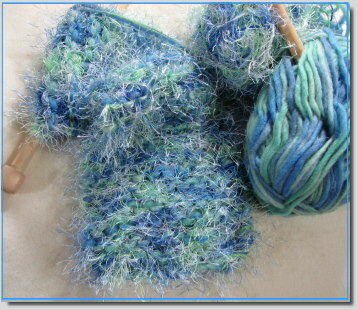 I paired it up with a furry little novelty yarn that matched perfectly and began knitting a scarf. It was pure pleasure. The making of Like the Stars coincided with my birthday. In the early stages of planning, I began thinking about quilting motifs that would carry the various themes of Daniel onto the surface of the quilt. One thing I knew: Like the Stars was predestined for some heavy quilting. Well, back to my birthday. Would you believe my wonderful husband gave me a new Bernina Aurora 440 QE, BSR (stitch regulator) and all, as a birthday present! It was love at first stitch and certainly a timely gift considering the project at hand. With the piecing completed, the time had arrived for surface work. Daniel is best known for his short stay in the lions’ den, so I chose this motif for the border. First, I digitized a lion (redwork style) and saved an additional file in mirror image. Next, I stabilized the areas on the underside of the quilt top where the lions would be embroidered. There is a great stabilizer on the market that is 100% cotton and can be ironed on. It’s the perfect choice for quilters who integrate machine embroidery into their quilts. With the quilt border stabilized, I now marked the positioning of each lion using printed templates. Rather than hooping the quilt, I chose to hoop a tear-away sticky stabilizer that I could completely removed after the embroidery was finished. This way the quilt could be easily positioned and there would be no hoop marks to deal with afterwards. When I completed the embroidery phase (Shadrach, Meshach, and Abednego were also embroidered in the center of the quilt), I put together top, batting (100% cotton), and backing with a light spray of 505 Spray and Fix. The emphasis is on “light.” Also, a word of warning for owners of Bernina machines that use the stitch regulator. Do NOT use other adhesive sprays such as Sullivans. Trust me, I know! Each section of the quilt had its own quilting motifs. For example, I used a fire motif around Shadrach, Meshach, and Abednego, a thin looping motif around the photo transfer verses, and a wavy motif in the diamonds. The quilting stage proved rather time intensive, but I loved experimenting with the stitch regulator and various needles and threads. And speaking of thread, I used multiple colors on this quilt, which accounts for lengthy time element. 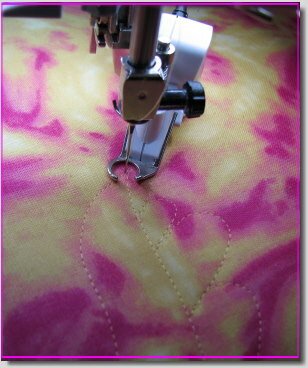 Also, I still use some hand quilting methods when I machine quilt, the main one being the popping of thread tails. Yes, I still knot those ends and pop them into the quilt sandwich. After applying the binding and sleeve, I blocked the quilt for about twenty-four hours. First, I covered a large carpeted area with plastic sheeting. Using t-pins and large rulers, I squared the quilt while at the same time misting it with distilled water. Next, I took a steam iron filled with distilled water (set on cotton) and slowly hovered it over the surface of the quilt, making sure it never actually touched the quilt itself. To speed up the drying stage, I placed a fan nearby and left it running the entire twenty-four hours. And that completes the story of Like the Stars. It now hangs in a private collection in Charlotte, North Carolina.